What I like most about my guy birthday card is the sentiment inside. It says, "No one else could fill your shoes." 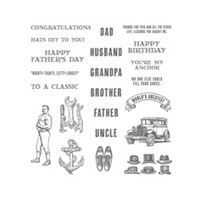 The Guy Greetings Stamp Set is perfect for making masculine cards with cute sentiments and images to help you make cards for the special men in your life. I used Sweet Sadie and Stacked With Love Washi Tape to add some fun color to my top layer and I folded it over my layer to get a good hold.